Take any north Baton Rouge student and sit them in Mumford Stadium. Let them groove to the Human Jukebox, marvel at the fancy footwork of the Dancing Dolls, cheer for the football players and soak in the legend of the Bluff – chances are they will leave so excited that even if they weren’t thinking of attending college, they will want an “S” on their chest. Now take Jane, our tenth-grade prototype. It is Saturday night and she is with her parents, part of a packed crowd in attendance at A.W. Mumford stadium. Jane loves the atmosphere and she can’t wait to be a part of it one day, not in pads however. Jane wants to dance along with the band. But as much as she has been practicing her dancing skills to prepare for that goal, she just isn’t being prepared academically to thrive at the university. It isn’t that Jane isn’t a great student; it’s just that her neighborhood elementary, middle, and high schools all received Ds on the most recent state report cards. With the public schools so vastly underperforming, charter school operators have been sprouting up by the dozen and magnet programs shifted and expanded to keep stellar students in area public schools. All of this leaves North Baton Rouge as a prime candidate for a new solution. “Your only option shouldn’t be to pray you get into a magnet school,” said Chris Meyer, president and CEO of New Schools for Baton Rouge (NSBR). The private charter movement began in the 1970s with the basic principle of a charter school to be reliant in part on public funding while operating under the model and concept of a private business. The ideal charter school is both free to the student and does not partake in selective admissions. But that isn’t always the case and the flight from public schools tends to cause more issues for the Parish than lack of proper college preparation and low test scores. One noted area underperforming school is Scotlandville Magnet High School. In 2014, Scotlandville received a D on their school report card. A schools report card score is the sum of a few different measurements. Schools are measured on exam scores, college readiness, graduation rates, and how the school fairs with students in individual target areas. Areas such as students who qualify for free lunch or students with disabilities . All of these points Scotlandville was classified as declining as of 2014. According to the report only 46 percent of Scotlandville’s students scored an 18 or better on the ACT . An 18 on the test, is a benchmark used in determining if students have minimum proficiency for college and career success. The schools best score since 2000 was a C in 2013. But every other year since 2000, Scotlandville has earned a D or a 1-star rating, classifying them as academically underperforming. In 1982, Scotlandville was the host of a Magnet Engineering Program that competed annually as one of top schools of the city and the state, functioning a solely magnet school from 1982-1998 before transitioning back to comprehensive education. Scotlandville’s magnet program offers multiple tracks including academic, engineering, business and governmental affairs. The school boasts a Center of Excellence for Business Entrepreneurship and maintains one of the states few high schools with an Academy of Engineering. Baton Rouge teaching artist and poet Donney Rose remembers the school from his time as a student in the Magnet majority window. Rose, who graduated in 1998, said he doesn’t see that Scotlandville has gone through a decline, but has in fact experienced a shift in emphasis. “There was always an underlying tension among members of the community, who felt robbed of their school,” he said. Rose, who was also a member of the Scotlandville community, growing up in Crestworth neighborhood, said he can recall a sense of frustration in the community from families upset that their children ouldn’t attend a school five minutes away from their house. In the late 1990s, there was an area movement to restore Scotlandville as the community high school. 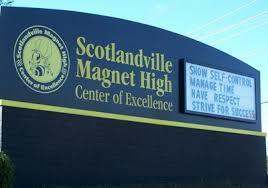 Now, Scotlandville’s student population is half traditional public and half magnet students. This change in student population also shifted the racial makeup at the school that some calls “white flight”–where white students and teachers left the magnet program for others. And while the grades and performance numbers may seem alarming and could possibly be attributed to charter school flight, Scotlandville High School’s magnet coordinator Beatrice Arvie said Scotlandville and new charter schools are not in competition. The numbers appear to prove Arvie’s thoughts as the charter alternatives have not been able to establish a high volume school in North Baton Rouge. As of 2014, Scotlandville had 1322 students enrolled compared to the 226 at Madison Preparatory Academy, the charter alternative for high schoolers in North Baton Rouge. 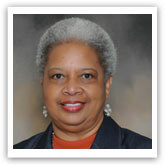 “I think that every school offers something for every child, and that Scotlandville has something very unique,” Arvie said. For both the charter school representatives and their public school counterparts, the goal appears to be the same: free, high-quality education for the students of North Baton Rouge. And there is nothing to suggest that the two cannot co-exist. Maxwell Martin is a 17-year-old high school senior. This article was written in association with the McKinley High School senior service project under the mentorship of Leslie D. Rose. Congratulations, Max Martin, for a very insightful article.